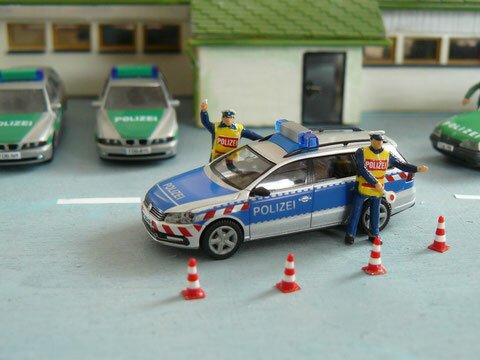 There is only one Autobahn police post in the whole county. It is located in Dohnsberg at the Bundesautobahn (federal expressway) 187. The station uses one old Mercedes E-Class, a Mercedes-Benz Sprinter and an old Opel/Vauxhall Omega. Furthermore there are two new BMW patrol cars. To follow and watch streetracers and tailgaters secretly, there is also an unmarked Audi A4. In the foreground, the unmarked Audi has pulled over an overloaded car, in the background you can see the police station. A view into the building - an officer at the telephone. In January 2014 the police men and women of the Autobahnpolizei were given a new Volkswagen Passat B7 Variant. This vehicle replaces the older Mercedes E-Class.